There's been a lot of press lately around the use of dogs trained to 'sniff out' bed bugs. We'll try to help you sort of fact from fiction regarding the use of dogs for this purpose. First, here's an article in the New York Times that sums up the current debate over the use of dogs for bed bug inspections Along with a recent video featured on ABC News examining the use of bed bug sniffing dogs. So what's the real value proposition here? Well, yes, dogs can be trained to respond to certain odors and can be valuable tools. Their noses and responses, however, should not be considered to be fully conclusive, regardless of their training or whether they are fed as a reward or as a matter of course. A dog is only as good as its training and handling, and even a well-managed dog may quickly lose interest or become distracted by competing stimuli. 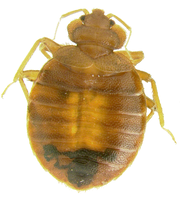 If a dog reacts as trained to the scent of a bed bug, this should trigger a thorough search by trained eyes to confirm the presence of an extant population of bed bugs. Treating based solely on a dog’s reaction is unwise and invites abuse. That's why IdentifyUS offers no cost/low cost information about bed bugs and their management with no third party pest control agenda. That's why we also recommend that you always attempt to positively identify live culprits at the scene. If you want a trained entomologist to help, start by completing a Specimen Evaluation Form and uploading digital images of your specimen to IdentifyUS.